New stage show, meet and greets with Daniel Tiger, and 3-5 year olds play for free! Daniel Tiger, Katterina Kittycat and Friend! Story Land has partnered with The Fred Rogers Company to debut a new musical show for the 2018 season. Story Land has partnered with The Fred Rogers Company to debut a new musical show for the 2018 season. Daniel Tiger and his friends will be joining the Story Land family of characters in a new musical stage show, Daniel’s Grr-ific Day! Daniel’s Grr-ific Day will open summer 2018 starring Daniel Tiger, the main character from the award-winning animated preschool series, Daniel Tiger’s Neighborhood (http://pbskids.org/daniel), along with his friend Katerina Kittykat. After the show, kids will have the opportunity to meet and greet Daniel Tiger and his friends! 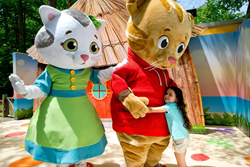 With Daniel Tiger coming to Story Land, now is the perfect time to take advantage of the all NEW Preschool Play Pass. This pass will grant kids between the ages of 3 – 5 FREE admission into Story Land for the entire 2018 season. To learn more about how to get a FREE Preschool Play Pass, visit https://www.storylandnh.com/prekpass. The company was founded by Fred Rogers in 1971 as the non-profit producer of Mister Rogers’ Neighborhood for PBS. In the years that followed, it not only created hundreds of episodes of this much-loved program, but also extended Fred’s values and approach to other efforts in promoting children’s social, emotional and behavioral health and supporting parents, caregivers, teachers and other professionals in their work with children. The Fred Rogers Company continues to build on Fred’s legacy in innovative ways through a wide variety of media, and engaging new generations of children and families with his timeless wisdom. The company’s highly-rated, award-winning children’s series include Daniel Tiger’s Neighborhood, Peg + Cat and Odd Squad. For more information, visit https://www.fredrogers.org/. Story Land, located in New Hampshire’s beautiful White Mountains, is a premier children’s theme park that has entertained thousands of families with young children for over 60 years. Story Land is “Where Fantasy Lives” and features over 20 unique rides, exciting live shows, and favorite nursery rhyme animals set on 35 beautifully maintained and landscaped acres. Story Land is owned and operated by Palace Entertainment, one of the leading leisure park operators in the United States. Palace Entertainment owns and operates eight water parks, six theme parks, two animal parks, and five family entertainment centers across 10 different states. For more information, please visit https://www.storylandnh.com/, or connect with us on Facebook, Twitter, and Instagram.